I took some time off from writing. Just too many pins in the air and not enough resources to juggle them all. Bad news: I'm dreadfully sick. Bronchitis, bordering on possible pneumonia. The Nurse Practitioner could hear crackling in all of my right lung and the upper lobe of my left lung. She actually asked me if I was a smoker! It started on Saturday. I woke up feeling like my throat was shredded. As if I'd been coughing for a week. But I hadn't coughed at all. Very odd. I just suffered through it. Sunday was worse. Added coughing to the mix. Probably the beginning of a sinus infection migrating into my chest. Monday was much worse. The fever hit. Barely measured at 100 degrees, but felt much higher. Very lethargic, very achy, and very hot. Did not enjoy it. It continued today. But I went to the medical building and got some help from Nurse Posey. 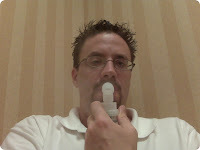 She hooked me up with a breathing treatment, some drug samples, and a shot of steroids, to speed the healing. Let me say for the record: that shot HUUUUURT! I actually jumped when he hit me in the "hip" with it. (For some reason, medical professionals say "hip" when they mean "buttocks.") After she hit me with that juice, it felt like I had an angry monkey fist in my back pocket for hours. Hopefully, all of the meds will help me out and I'll be back at work tomorrow. Had to leave early, today. Took a two hour nap. Seemed like 6 hours has passed. Best sleep I've had in days. Goods news: Contiued to work on several of my projects. The adventure with Roger is moving along. The house is coming together, too. Worked on the hallway this weekend (crown molding!) And Cindy has been wrapping up the painting in the bathroom. Labor Day marked the official One Year point of working on the house. Not as far as I'd like to have come, but we've got three rooms done, and have four more to go.